While this is almost completely unrelated to real estate, I just had to add a category for my food, beverage and restaurant review. This is my blog, right! So focus can some time go out the window. I’m in the habit of taking a picture of a plate of food or bottle that I’ve enjoyed and want to remember. About a week ago my family ambled over to Orphan in East Sacramento one Saturday morning. I read the Yelp reviews and wanted to experience it for myself. Orphan is a breakfast joint that took over the formal Moxie Jr. location (Moxie’s [the original] is one of our favorites for an upscale dinner). Orphan is owned by the same folks as Tupelo Coffee, which is part of the Naked Coffee Roasting Co.
I’m not sure if this picture looks appetizing, but it was soooo good going down. 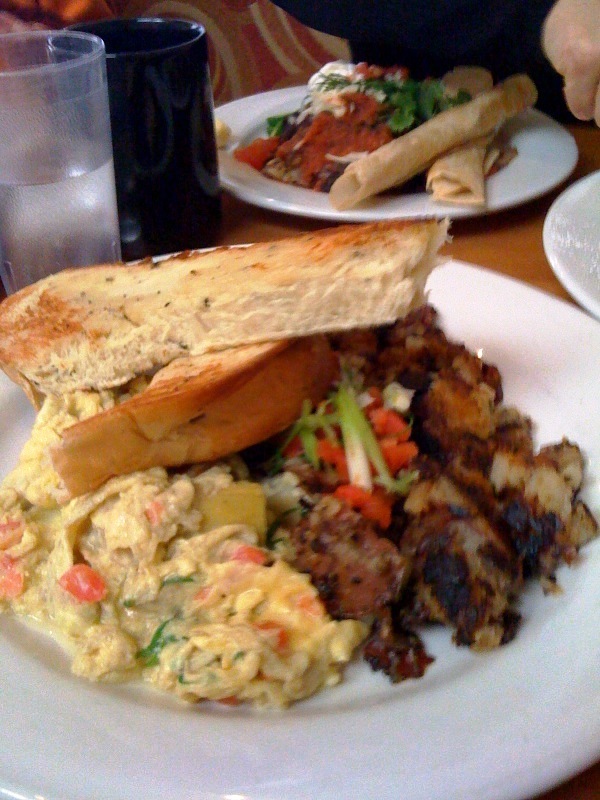 It was an artichoke heart, tomato scramble thingie, with fresh baked bread. Oh, and if you are a coffee lover… their coffee blew my doors off. I mean, at first the whole spiel about how they brew each cup special, etc., etc…. I was like, yeah whatever, just give me the coffee! Then to drink this nectar of the gods… put it this way, I bought a pound to take home. This entry was posted in Local Eats and tagged advice, Food and Beverage, fun, Happenings, Real Estate, Sacramento. Bookmark the permalink.